While historical epics showcased stories set in antiquity, religious epics drew inspiration from the world’s most popular book, The Bible. Whether depicting the Old Testament or the New, biblical epics were always large in scope and featured some of the day’s state-of-the-art special effects. Though Hollywood stopped making large-scale epics in the 1960s due to massive costs, audience interest has never waned and many remain popular viewing on television, particularly around the Easter holiday. Directed by Henry King, who previously touched the divine with The Song of Bernadette (1943), this Old Testament-inspired epic starred Gregory Peck as the biblical King David, the second king of Israel. A tale of downfall and atonement, the film follows David’s rise to the throne and falling prey to sins of the flesh when he begins an affair with Bathsheba (Susan Hayward), wife of his most trusted solider Uriah (Kieron Moore). After he forces Uriah to embark on a suicidal battle, thus freeing himself to be with Bathsheba unhindered, David neglects his people and sees his kingdom destroyed by God, ultimately leading to his redemption. Moderately well received, David and Bathsheba was a big hit at the box office and one of the most popular films of 1951. Based more on Lloyd C. Douglas’ best-selling novel than on the bible, The Robe was the first movie to ever be shot in CinemaScope while turning Richard Burton into a star. Burton played Marcellus Gallio, a decadent Roman tribune tasked by Pontius Pilate (Richard Boone) to supervise the crucifixion of Christ, after which he wins Jesus’ robe in a dice game. Slowly but surely, the robe’s mystical powers begin to take hold of Gallio, who eventually gives up his wastrel ways and becomes an ardent follower of Christ, even sacrificing his own life in the vein of his savior. While Burton’s Oscar-nominated performance might feel stodgy to modern audiences, The Robe remains a grand spectacle that is routinely aired around Easter. Another great film drawn from the Old Testament, Cecil B. DeMille’s The Ten Commandments was an extraordinary film and the last of the director’s career. Starring Charlton Heston in a star-making performance, the film followed the story of Moses from his discovery as an infant by the Pharaoh’s daughter to becoming the Pharaoh’s adopted son to freeing his people from the bonds of slavery. A grand spectacle, The Ten Commandments benefits greatly from Heston’s performance as well as those of Yul Brynner as Ramses II, Anne Baxter as Nefretiti and Edward G. Robinson as Dathan. Though nominated for seven Academy Awards, the picture only won for its special effects, which were amazing even by today’s standards. 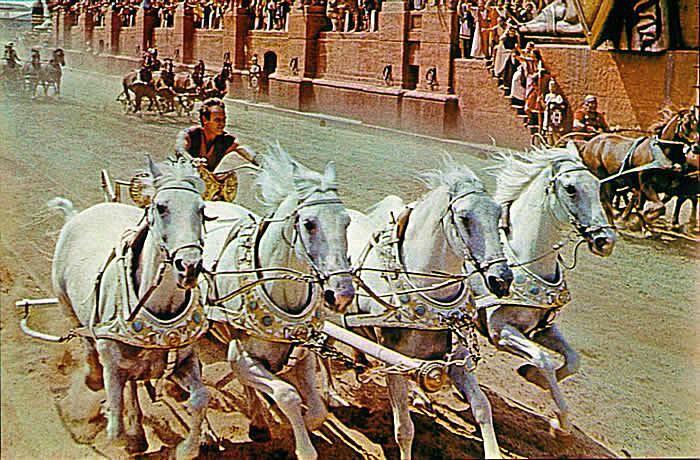 The mother of all biblical epics, William Wyler’s Ben-Hur was a landmark film that pushed the boundaries of what was possible in filmmaking while becoming one of the most successful pictures ever made. The film starred Charlton Heston as Judah Ben-Hur, a prince who is sold into slavery after being stripped of his title on trumped-up charges of attempted murder by Messala (Stephan Boyd), an ambitious Roman tribune and Ben-Hur’s childhood friend. As he struggles to regain his freedom, he maintains his thirst for revenge against Messala, but along the way crosses paths several times with a radical teacher named Jesus Christ, which in the end leads to Ben-Hur’s own redemption. 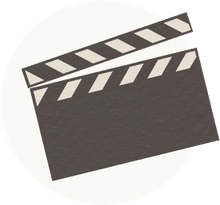 Winner of 11 Academy Awards, including Best Picture, Best Director and Best Actor for Heston, Ben-Hur was the pinnacle of epic filmmaking and has since become standard viewing on Easter. Previously made in the silent era by Cecil B. De Mille, King of Kings remains one of the better movies to be made about the life and death of Jesus Christ. Directed by Nicolas Ray, the film offers no surprises in covering familiar ground but rises above the competition for adding political context to the tale while also becoming one of the first major studio films to show Christ’s face on screen. As he becomes more actively involved as a teacher and a healer, Jesus (Jeffrey Hunter) stands in contrast with the rebel Barabbas (Harry Guardino), who is joined by Judas Iscariot (Rip Torn) in taking the fight to the occupying Romans head on. Though dismissed by critics upon its release, King of Kings has risen in stature to become a biblical classic. Featuring a large A-list cast and directed by George Stevens, this New Testament epic depicted the life of Jesus from the nativity to the resurrection, and divided critics while failing to recoup its massively overblown budget. The film starred a then-unknown Max von Sydow as Christ, who made his English-language debut in the film, and contained a who’s who of actors in major roles like Dorothy McGuire as Mary, Charlton Heston as John the Baptist, Claude Rains as Herod the Great, Telly Savalas as Pontius Pilate, Sidney Poitier Simon of Cyrene and Donald Pleasance as Satan. With everyone from Robert Blake and Pat Boone to Angela Lansbury and John Wayne making brief cameos, The Greatest Story Ever Told actually proved to be a distracting experience thanks to the parade of star, especially Wayne with his almost comical line about Jesus truly being the son of God. Still, the movie remains worthwhile despite its flaws.